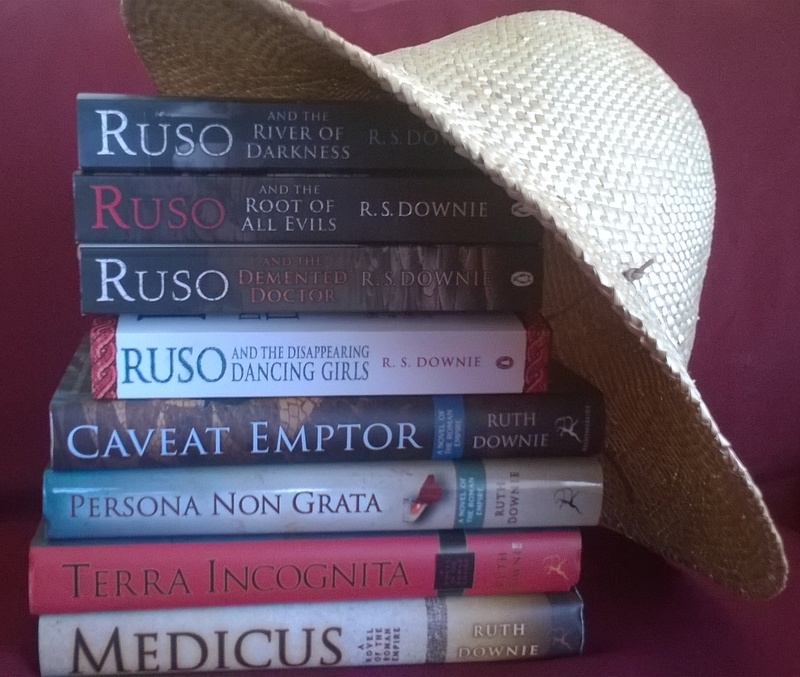 I’m delighted to announce that Bloomsbury are now taking over publication of all the Medicus books. 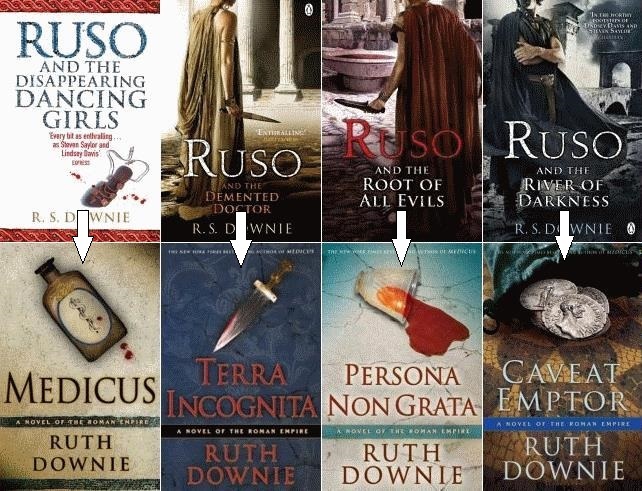 This means that the first four books, originally called “Ruso and…” in the UK, will be renamed. Each book in the series will have only ONE title everywhere – hooray! As there are four books being renamed, I’m celebrating by giving away a free signed copy of any book in the picture (your choice) to each of four lucky winners. 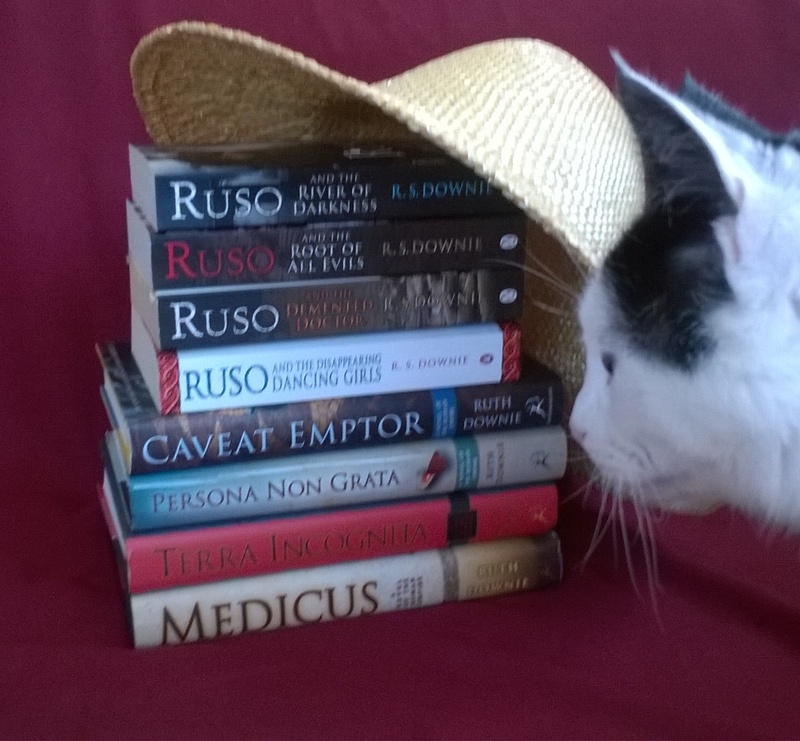 Winners’ names will be drawn from this fine Roman re-enactors’ hat late on 30 April. The cat will NOT be in it, no matter how hard he tries. Congratulations – in one fell swoop Bloomsbury becomes your publisher and clarifies the multiple title issue. What does this mean for the jacket designs? Thank you Ray. At the moment the jacket designs will be the same ones as in the States, designed by Bloomsbury US – tho’ there is talk of a rethink. I guess it’ll depend on how well they do. I agree that consistency is good and that two titles per book was confusing, but I think I preferred the British titles. The American titles are more concise and snappy, but they’re also more cryptic, and don’t mention Ruso. But I suppose what matters is that the author should be happy with them. Readers will get used to them, whatever they are. An author/publisher with a whimsical turn of mind might experiment with random titles: “Cow pats in summer”, “Donkey rising”, “A turn for the verse”, “Splodge”, and so on. There really should be a poem called “Cow pats in summer” – written by the lost cousin of Rupert Brooke and John Betjeman, perhaps. “Donkey rising” – yes, it sounds as though it could be an inspiring work. And I think “Some disgruntled evening” has yet to be written. I’m reading Winston Graham’s ‘Ross Poldark’ and the character Jud calls them ‘cow-flops’, which I think is much more descriptive! Absolutely! Maybe it’s a Cornish thing. I’d love to be in the drawing (about as much as Tilla would love to have your beautiful mouse-repellant cat)! No worries Tony, if your name comes up you can decide later. All well here thanks, and presumably all well with you since you’re in Lanzarote. First draft of new book is done, which is… quite a long way from ‘done’ really. Good wishes to Andrew. I have all your books in every available medium, so I will let some other deserving soul have a chance not that I ever win anything ). Just wanted to say congratulations on having a publisher pick them up. I hope there will be many, many more books. Thank you so much Lora, and apologies for the slow reply. congrats and I look forward to more Ruso and Tilla. I hope this will help a broader audience get to know your books! Oh whoops, sorry, that was supposed to be a 🙂 – I’m not very good at typing with no keyboard. Thank you Jane, your name is indeed in the hat. The titles made me laugh! Why indeed has no-one written “Ode to a nightshirt”? Your book Medicus is already on my “to be read” book pile. I am in the last stretch of grad school and am reading so many books and journal articles along with primary sources on a daily basis that pleasure reading is almost a thing of the past. I look forward to the soon to be end of my grad school experience, a hopefully full time job in my field (History) and a time to enjoy all of your books. Best wishes for the final stretch, Deb – and I hope you enjoy ‘Medicus’ and much else when you finally get time to relax! These books are on my TBR list, they sound fascinating! 🙂 I’d love a chance to win a signed copy, but before I enter – is this open for anyone or only residents of certain countries? Hi Ulla, No worries, I haven’t put any restrictions on who can enter or where they have to be. Good luck!